Your body is a magical abode. It is where your whole life happens. Join Brian Nygard + Dages Juvelier Keates on this incredible opportunity to dive into 30 hours of transformative KatonahYoga® training. This 30 hour training and retreat is designed to enable, empower, and equip you with a robust set of Katonah techniques for good housekeeping; enjoy your parties, and clean them up! Unhold into an unmediated experience of your complex, continuous, nomadic abode through asana as origami, potent pranayama, attuned adjustment, and applied meditation. Learn techniques to richly embody and teach your practice. If you have been desiring a dive into the deep end of Katonah material, come swim with us in Panama! You will receive 30 hours of hands-on Katonah training, bankable for those seeking to become Katonah Yoga teachers. Daily asana, pranayama, meditation classes will be supplemented by articulations and experimentation with Katonah theory both on and off the mat. This 30-hour intensive can be counted towards a 200hr KATONAH YOGA® Teacher certification. KATONAH YOGA® was founded by Nevine Michaan, and is a Hatha yoga practice refined over forty years, blended with Taoist theory, sacred geometries, pranayama, and meditation. For more information, visit www.katonahyoga.com. This retreat is open to everyone!. If you are training to become a teacher, you need to have completed (or plan to complete) a separate 200 hour Teacher Training. See here (https://www.katonahyoga.com/become/) for more details. 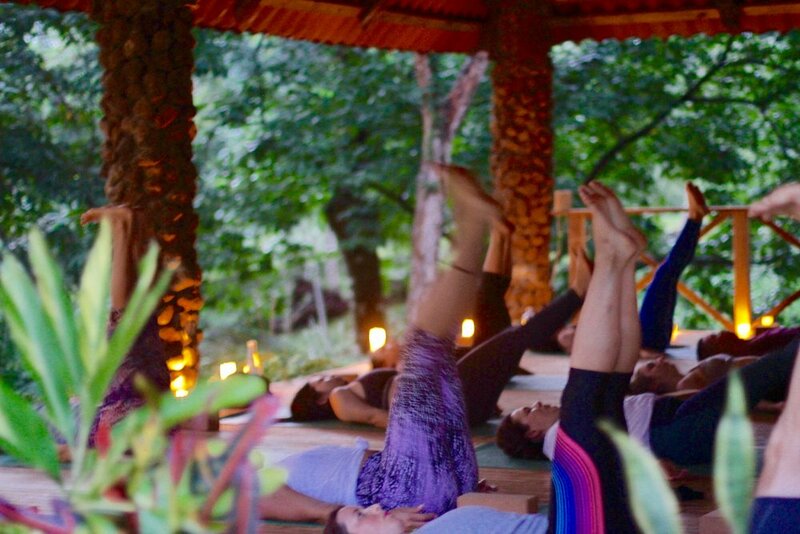 On this adventure in nature, in the sea, and in the alchemical practices of Katonah Yoga, you will learn techniques to come home to yourself. We will find fluency and flexibility, presence and potentiation, in snorkel masks, on surf boards, and in shavasana. -- delicious healthy breakfast, lunch + dinner every day. 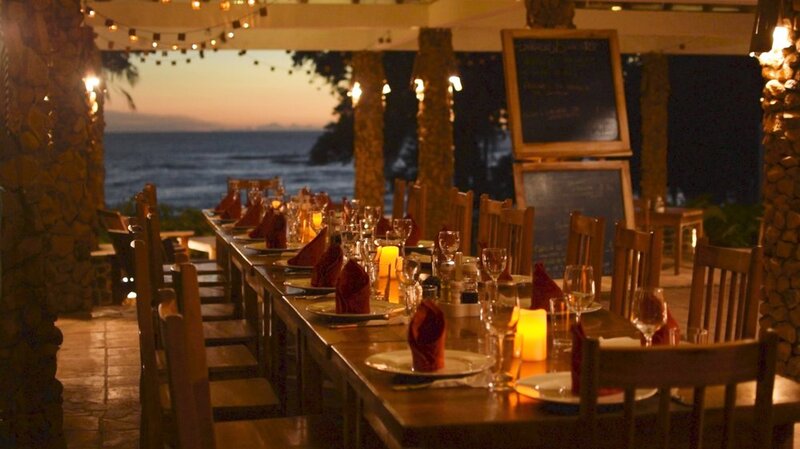 dining at our waterfront restaurant, as well as a sampling of some of the best local restaurants in our village. offering you a deliciously unique and immersive experience. vegetarian, vegan + gluten free meal plans available. -- unlimited use of our bikes, kayaks, Stand up paddle boards, snorkels, bodyboards and surf boards at your leisure. ** optional extras: add a massage, horse-riding, surf lesson, Guided Hike, and/or snorkeling + diving at the exquisite unesco heritage listed coiba national park. you can also add on accommodation days to extend your stay! Just let us know your desires and we will work this into your retreat. As a teacher, Dages is committed to sharing her wealth of knowledge. She is approachable and eager to explain her insights. Beginning in 2002, her studies have earned her accreditations in both the Bihar and Kundalini lineages. Her syncretic teaching style has been profoundly impacted by immersion in studies with her mentor Nevine Michaan, founder of Katonah Yoga. Katonah Yoga synthesizes Taoist theory, hatha yoga, breathwork, and meditation to create strength, structure, and stability. Dages is on the staff at both Katonah Bowery and Sky Ting in Manhattan. Recent collaborations include a series of workshops with Elena Brower pairing pranayama and aromatherapy, and retreats and teacher trainings with veteran Katonah teacher Abbie Galvin, Sacred Fig founder Anton Brandt, and Sky Ting co-founder Chloe Kernaghan in Bali, Dominican Republic, Greece, Morocco, and Panama. Her accomplishments were recently acknowledged in a featured edition of Yoga Sleuth which can be seen here! Brian a dedicated yogi, musician and teacher living in New York city. He discovered yoga after suffering from chronic pain in his spine for many years. His recovery motivated him to explore and to study yoga asanas and philosophy for over ten years, giving particular emphasis to vinyasa and traditional hot practices. With over 5000 hours of teaching experience, Brian regularly teaches private sessions, corporate seminars, public classes and teacher training programs internationally. He has also guest taught at the united nations. His teaching balances a vigorous physical practice with careful alignment, restoration and attention to the breath. Daily, Brian travels New York’s boroughs, leading classes of up to 70 students through sequencing that is both clear and accessible. if you would like to join our transfer from Panama City to Santa Catalina, please be at the arrivals gate of Panama City Airport (PTY) no later then 8.30AM on your retreat start date. Or, if you are already in Panama City, we will pick you up at a central meeting point AT 10am. Book your return flight for 6pm onwards on your final retreat day - our transfer will have you back into Panama City around 4pm.